Lorelei is the last item released in May and Kitty is just in time to finish review it. It is named after the goddess of wind and you can be sure it is cool and this dress is almost like a super heroine uniform! 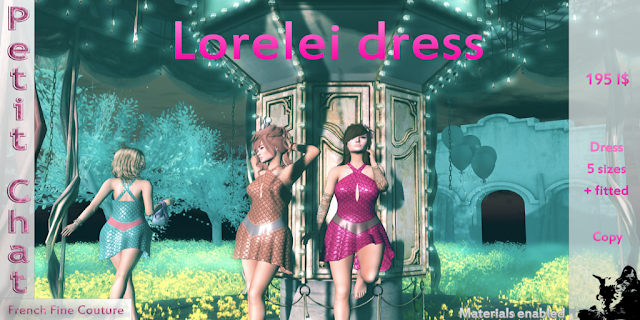 Lorelei comes in 8 colors combinations with the dress and belts in selected colors. It comes with 6 sizes including fitted mesh and the first one here is water which is clear, cooling and you can see why Kitty enjoy dancing in it. The next is salmon and it is probably a related color with water because... well its fish and water... :) It is light in color and comes with a nice belts and a cool chest cutting and sleeveless to really make this summer a cooling one. The Purple Lorelei is almost out of this world and you seldom comes across a bright and cheerful purple like this. This would be a good addition to the wardrobe. Well, how's a Lorelei Grey then? This give you a choice if you are not all into bright and shiny color. The Grey is subtle, but yet elegant and it is great for a casual dinner where you do not want too much attention. The Fuscia is becoming one of Kitty's favorite because it is rich in color and yet it is not overly bright. Fuscia is most suitable for more formal occasion where you really want to look good, but not too childish. Although its not Xmas, but who saids you cannot take a picture in North Pole in the summer. This is the Brick color which is unique and doesn't it reminds you of the hard and strong brick on the little pig's house. Well power and strength is exactly what this dress radiates! The last color is Anthracite and it is darker and easily allows you to hide in the shadow and dark of the night. Kitty would imagine this could be a assassin unique, but of course Kitty is pretty sure the creator did not mean it this way. Well Kitty has chosen a dark background to show you how well this color can hide. Beside of the shadow because Kitty might just be lurking around in the Anthracite Lorelei.